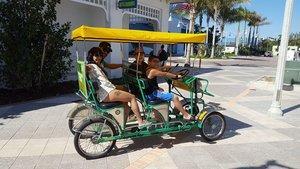 Hollywood Beach Trikke in Hollywood, Florida, conveniently located on the beach boardwalk, is a unique family owned Fitness boutique that offers visitors fun and exciting rides on a Trikke, a three wheeled Fitness machine that is body propelled. With miles of spectacular beach, Trikke enthusiasts can enjoy relaxing rides and stunning ocean views any time of the day. 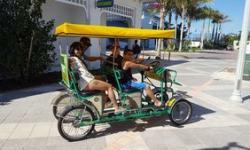 At Hollywood Beach Trikke water safety is our concern, and we offer swimming lessons and CPR training for adults and children, and participants receive life vests that are Coast Guard approved. Our Segway tours are fun and memorable Outdoor Activities that allow you to explore the area in an unique and interesting way on a Segway.